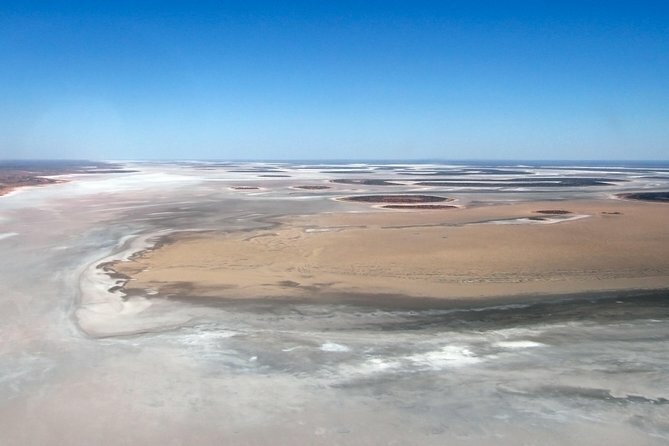 Fly over the Northern Territory's largest salt lake and witness the spectacular contrast of colors. Fully experience the Australian desert environment, with the possibility of seeing wild camels. Enjoy guaranteed window seats on all flights. Your professional pilot will provide you expert commentary along the way. Take off from Ayers Rock airport and fly the northern and western faces of Uluru (Ayers Rock) before you pass along the northern and western faces of Kata Tjuta (The Olgas). You will even have the opportunity to view the elusive eastern face of Kata Tjuta, which is not accessible to the public. Fly over the remains of an ancient coral reef on the way to Lake Amadeus. Once overhead the lake, the pilot will conduct some orbits at low level so you can witness the incredible patterns on the surface of the lake and the beautiful colors that make this one of the most breathtaking views in the area. Climb up and take in the 112-miles (180-kilometers) of the lake and its patterns. Your local pilot knows all about Uluru, Kata Tjuta, Lake Amadeus and its surroundings and will provide you with expert commentary, so please feel free to ask as many questions as you like. Experience a view like no other!